It is no secret that I am a huge fan of mussels! I can only really get hold of them during actual mussel season here in Berlin. I love bringing home a big pack of mussels and their shells clinking away as you pour them into the pan. 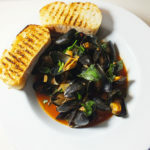 My popular go to dish is Mussels in a White Wine Sauce with Garlic Butter Ciabatta. You just can’t beat scooping up that delicious broth with some crispy garlic bread. And I think with mussels it quite often is all about that sauce or broth that they were steamed in. 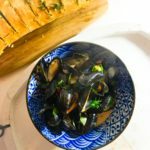 For a little extra kick I love a big bowl of Coriander and Harissa Mussels that has a delicious Eastern Mediterranean feel to it. 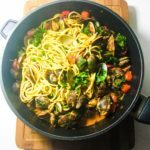 Yet the ultimate comfort food really has to be a Spaghetti Vongole, slurping on those bits of pasta with tender little clams in the mix. Pure heaven! 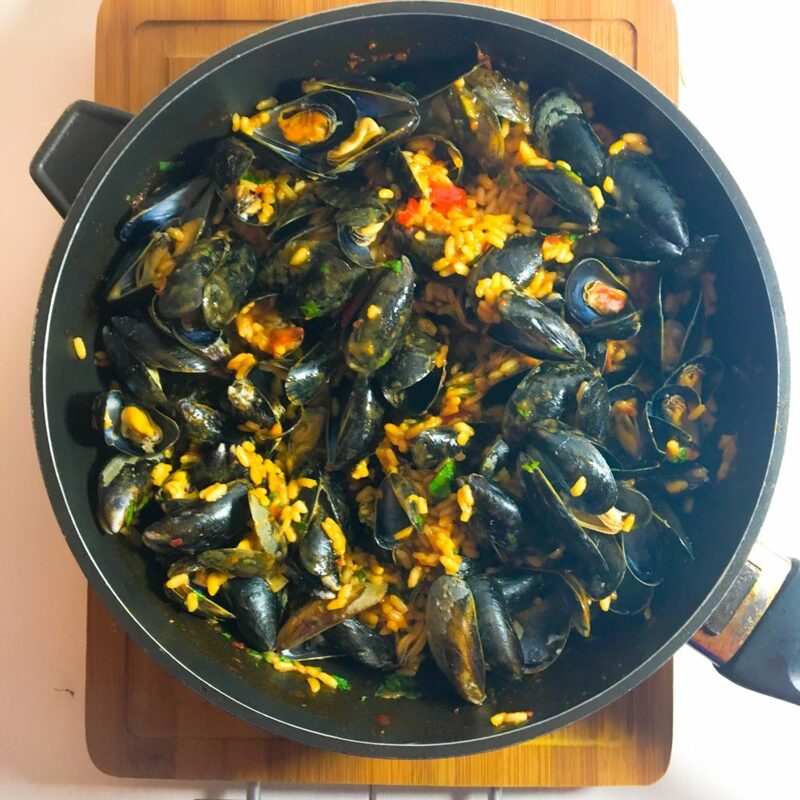 Mussel and Saffron Risotto is incredibly easy to make and is very laid-back food that still feels impressive. Maybe that is to do with the golden strands of saffron that brightens up the plate and provides a beautiful, delicate taste. This recipe also involves just one pan which is always a winner for me! Yet with any risotto dish I always urge for there to be patience and restraint. It is very easy to go all in and pour of all the stock straight away. But you really need to just slowly add spoonfuls with regular, but not constant, stirring. No one likes a sticky, mushy risotto! eed to just slowly add spoonfuls with regular, without it being constant, stirring. No one likes a sticky, mushy risotto! In a large/ deep pan add a dash of olive oil. Once hot add the shallots with a pinch of salt and cook on a medium heat for around 5 mins or until they are golden and tender. Then add the garlic, chillies and tomatoes. Stir again with another dash of olive oil and cook for a further 3-4 mins until the tomatoes are soft and tender. 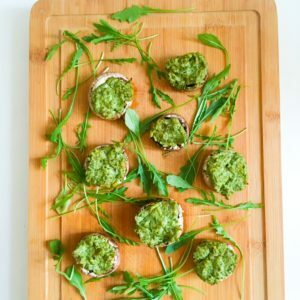 They shouldn't be mushy or overcooked and do not need much time as they are finely sliced. Season the pan with salt and pepper. Add the risotto to the pan with the saffron. Then pour in the white wine, keeping the pan on a medium heat. Cook for just 2 mins until the wine starts to boil down. Stir the risotto regularly to avoid it sticking. Pour in a bit of the vegetable stock. It should be another to completely cover the rice so it looks like a stew and the rice is beginning to float. Give it a good stir then stir it every minute or so. This will take around 4-5 mins until you need to do add more stock. Repeat as before until you have that final amount of stock left in the jug. Add the mussels to the pan and pour in the final glug of stock. Give everything a good stir so the ingredients are all combined then put a lid on the pan. Keep it on a medium heat. The mussels will need around 8 minutes to cook. You can give everything a quick stir halfway through to check the rice isn't sticking by quickly removing the lid for just a few seconds. If it is sticking then add a bit of water to the pan. Once the shells of the mussels are opened take the pan off it's heat. Pour in the lemon juice and add the fresh parsley. 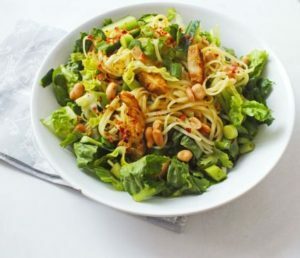 Season with a little more black pepper and give everything a good mix. Serve right away.